This tutorial is dedicated to pattern #8588. I've had a lot of people asking me how to make this on facebook so I've decided to make a tutorial on how to make this very simple but great looking bracelet. The jipijapa is basically a chevron. 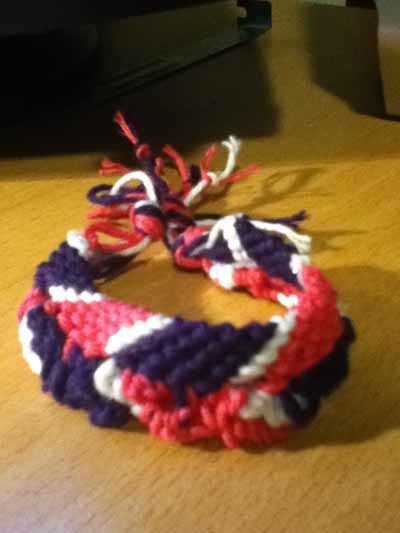 This bracelet is easy for anyone who is new to making friendship bracelets or advanced. 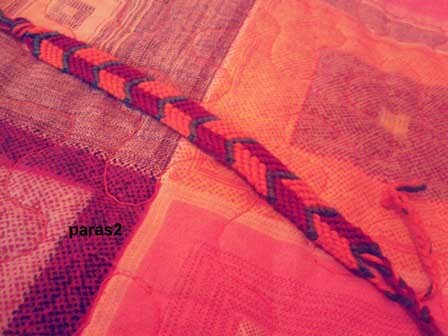 To start this 10 string design, you will need 3 colours. For this one I've decided to choose purple and gold. I've used 4 dark purple (A) and 4 lighter purple (B) for the block colours and 2 gold (C) for the arrow shape. The strings need to be about 80 cm (32 inch). Then when you are ready arrange them as A A A A C C B B B B B like in the photo below, see picture 1. 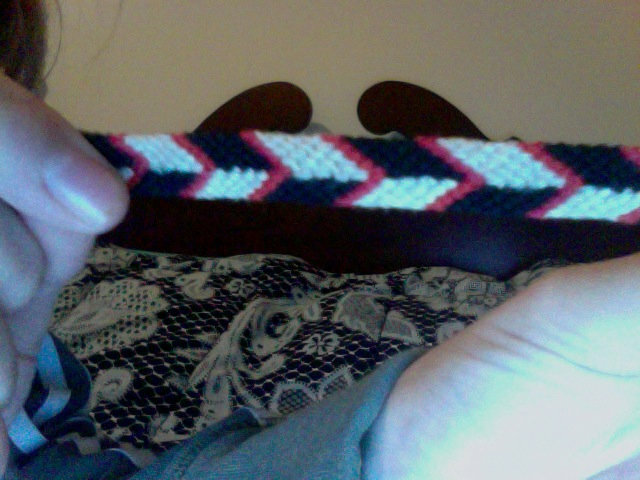 This bracelet starts in the middle. Note that the pattern mentioned above is the other way around: Starting on the outsides. The end result will be the same though! It's only knotted 'upside down'. Picture 2: Take both your C strings and make a forward knot in the center, then continue with the forward knots over the B strings until you have something like in picture 2. Then with the C string in the middle you want to do backward knots over the A's and create your gold arrow shape like in picture 3. Then starting from the middle again you will be doing the same thing , first with the A over the B like in picture 4. Then with the first lighter purple (B) in the middle you want to do backward knots over the darker purple. See picture 5. Continue doing this. All knots in the middle are always forward knots. You want to continue doing the same until you get the gold back in the middle. See picture 9. Repeat the steps above (Read A as B and B as A though!) till you have the length you need. You can also do this the normal way, like the original Chevron. You can also do this with as many strings as you want! 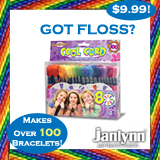 Its a great and easy and FUN friendship bracelet! The original author of this tutorial is Acid, but it has also been edited by Stefan, Foz, Jeckle, Huntress, Sareana, twilove1901, Ducttape10, krupa1030, gracebri, braceletlover07, BraceletBonanza, Kestrel, Alicat, buffyvs527, horsyg11, bundoo, kleinevos, gmbong00, iheartmrbump and Jed13. The tutorial was last updated 1 year ago.